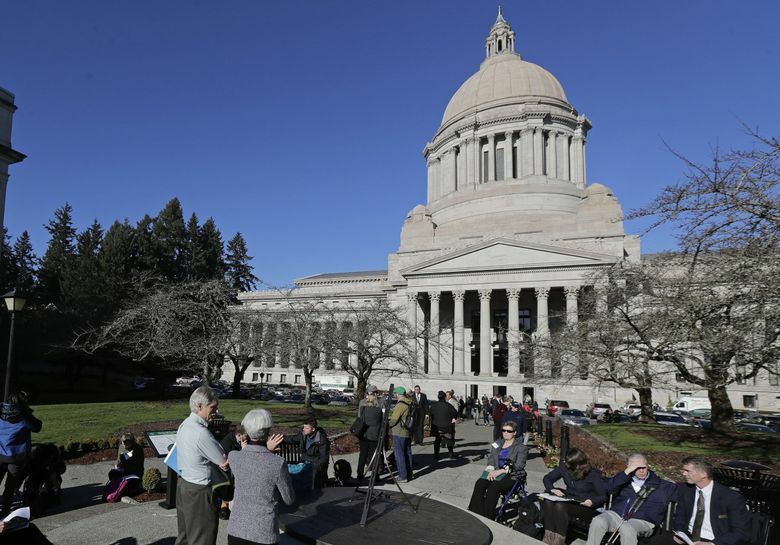 OLYMPIA — Washington’s hot economy continues to pump black ink into the pens of state budget writers, with new projections of collecting roughly $860 million more in existing taxes pouring in through 2021. Announced Wednesday, the news did not dampen Democrats’ calls for new taxes, which they call necessary to properly fund a new two-year state budget. Republicans cheered the new revenue forecast — and quickly argued that Democrats can fund a budget without tax hikes. Some called for tax cuts. So begins budget season in Olympia. For the next month or so, lawmakers will put forth proposals, exhortations and arguments over tax policies that affect every corner of the state — and more often than not, reinforce traditional partisan divides. The latest forecast numbers, from the state Economic and Revenue and Forecast Council, mean that without raising any taxes, lawmakers are projected to have almost $50.6 billion to fund the upcoming 2019-21 state operating budget. That represents a nearly 16 percent increase from the existing two-year budget when Gov. Jay Inslee signed it into law in June 2017. But Democratic legislators say tax hikes are needed in part to fund priorities while also providing roughly $4 billion for a required K-12 education plan that was passed in 2017. “But it doesn’t take away from the arithmetic problem that we came here with,” said Ormsby. The situation has left Republican legislators — who now find themselves in solid minorities in the state House and Senate — calling for tax cuts. In recent years, the state’s economy has continued reeling in higher-than-expected tax collections. Last year, lawmakers took more than $1 billion in higher-than-expected revenue to pay for a one-time property tax cut and fund the last chunk of a K-12 school funding plan ordered by the state Supreme Court. Inslee and Democratic lawmakers have said that maintaining those higher K-12 education funding levels will eat up much of the new revenue that has come through the door. Lawmakers this year are also tasked with boosting special-education funding and overhauling the mental-health system. Meanwhile, Democrats have for years griped about Washington’s tax system — considered the most regressive in the nation — and how it hurts low- and middle-income taxpayers. And they point to the fact that the current system — which relies heavily on sales and property taxes — doesn’t capture revenue from all of the economic growth in the state, such as the high-tech sector. House lawmakers are expected to release their budget plan — and revenue package — early next week. The Senate is slated to release its own plan sometime after that. Among other programs, the state operating budget pays for parks, prisons, schools, and social-service programs. In December, Inslee proposed a $54.4 billion two-year budget that boosted education spending and laid out a broad plan to reform the mental-health system. The governor also provided funding for his clean-energy package, as well as $675 million to fund new collective-bargaining contracts giving raises to state workers. To pay for it, Inslee’s plan included a $3.7 billion tax package that included a proposed capital-gains tax, and a hike in part of the business-and-occupation tax. Three Democratic senators previously said they’re not too keen on the capital-gains tax, calling into question whether that could pass the Senate.